Are You Committed to the Future of Primary Care? This fall’s premier event for innovation and policy leaders is fast approaching! 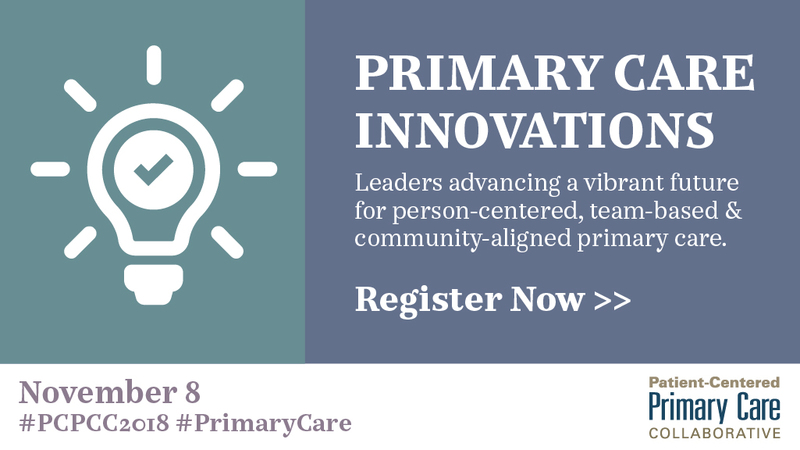 PCPCC's Annual Conference will address key strategies to elevate primary care and include educational sessions and in-depth discussions on how we can make our vision for primary care—one that is person-centered, team-based, and community-aligned—a reality. Join us on November 8, 2018, in Washington, DC. 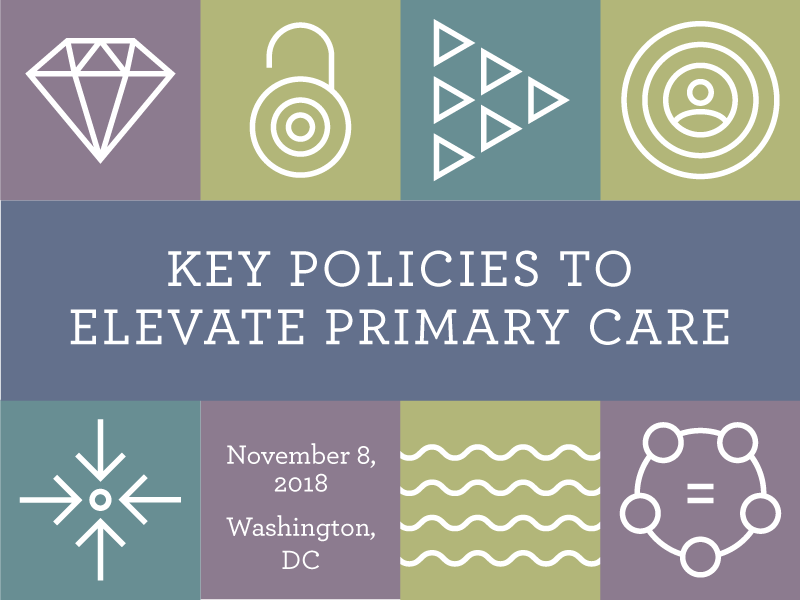 Attendees at Key Policies to Elevate Primary Care, will learn ways to spread and scale advanced primary care through evidence-based policies, benefit design changes, and patient-family engagement efforts. The PCPCC hotel room block is almost SOLD OUT. If you have not done so already, please make your hotel reservation as soon as possible. You must reserve before October 17, 2018, to receive the special PCPCC discounted rate. Join us November 8, 2018! On November 9, 2018, PCPCC will host an Executive Members-Only Workshop during which primary care thought leaders from across the nation will come together to discuss strategies that will increase investment in primary care - on both the state and national levels - to improve healthcare quality and affordability. The interactive Workshop will feature leaders from states that are implementing strategies to increase primary care investment. Leaders participating in the Workshop intend to develop a plan to gain momentum in the movement for greater primary care investment to additional states. Participants will be encouraged to remain engaged as PCPCC and partners work to create the changes identified during the Workshop. You can visit the PCPCC conference website to learn more about the goals of the Workshop, view the agenda, and to register. PCPCC is offering 25 scholarships to patient advocates. The scholarship will waive the PCPCC Annual Conference registration fee. Please visit the PCPCC website to learn about the application process. To learn more about becoming a PCPCC Executive Member, please visit the PCPCC website. You can view the list of Executive Members and fill out the membership application. If you have any questions, please email Jennifer Renton, [email protected].org. This webinar brings together exciting new research and real-world results to demonstrate how Accountable Care Organizations (ACOs) with a strong primary care foundation spend less and achieve better results for patients. Participants will have the opportunity to learn about recent complementary research from Harvard Medical School and the Patient-Centered Primary Care Collaborative/Graham Center leveraging data from the Medicare Shared Savings Program (MSSP). Bon Secours Medical Group will provide a real-world perspective on these findings, sharing their experience leveraging Patient-Centered Medical Homes efforts in an ACO. September 24 - PCPCC submitted comments to the Centers for Medicare and Medicaid Services (CMS) supporting changes in the Outpatient Prospective Payment and Ambulatory Surgical Center Payment Systems that seek to align payment rates across settings, so that patients can choose the setting that best meets their needs. PCPCC wrote that the transition to alternative payments that reward value requires a site-neutral payment system that does not incentivize a specific setting. September 18 - PCPCC’s members discussed the proposed MSSP Pathways to Success rule and potential member comments. Members agreed with the importance of highlighting PCPCC’s recent evidence report linking successful PCMH transformation with better outcomes in the MSSP program, as well as recent research by others emphasizing the importance of primary care in ACOs. Other areas of PCPCC member agreement included the need for reducing complexity in the MSSP program, supporting physician-led ACOs, and the importance of maintaining a gradual on-ramp to risk. September 12 - PCPCC members convened for a workgroup on the integration of behavioral health and primary care. Members identified a wide range of opportunities for PCPCC including opportunities to improve existing behavioral health payment codes, empowering patients and clinicians, and influencing alternative payment programs. September 10 - PCPCC submitted comments to the CMS on the Physician Fee Schedule and Quality Payment Program. PCPCC emphasized the importance of maintaining forward momentum on value-based and alternative payment models, reducing unnecessary documentation burdens, using technology to support approaches like eConsults, promoting interoperability credits for PMCHs, and allowing risk under Medicare Advantage plans to count for MIPS credit. August 29 - Delaware Governor John Carney Jr. signed significant primary care legislation, Senate Bill 227, into law. PCPCC engaged with Delaware policymakers in advance of the legislation. PCPCC issued a press release applauding Governor Carney for signing into law Senate Bill 227. August 8 - PCPCC released its annual Evidence Report, the first-ever study examining the interaction between the Patient-Centered Medical Homes (PCMHs) and Accountable Care Organization (ACOs) through both qualitative and quantitative methods. The research showed that ACOs that leverage advanced primary care models achieved improved population health, lowered costs, and enhanced patient experiences to a greater extent than those that did not. July 30 - PCPCC submitted comments to US Health & Human Services (HHS) stating that the exclusion of health clinics providing a full range of family planning services from Title X would undermine our nation’s public health and weaken an important component of America's primary care delivery system. July 26 - PCPCC issued a statement in response to the Administration's announcement that it would resume risk adjustment payments for heath plans that enroll higher-risk individuals, such as those with chronic or pre-existing conditions. Is Your Organization Living out the Shared Principles of Primary Care? We need your submissions! PCPCC is building-out webpages that provide journal articles, research, and tools to help practices and policymakers understand our vision of primary care as embodied in the Shared Principles. We welcome examples that your organization has developed that could be linked to the Shared Principles. The seven principles say primary care should be: person- and family-centered, continuous, comprehensive and equitable, team-based and collaborative, coordinated and integrated, accessible, and high value. If you would like to showcase your work, please email Allison Gross ([email protected]). In August, PCPCC released our seventh annual Evidence Report - Advanced Primary Care: A Key Contributor to Successful ACOs. 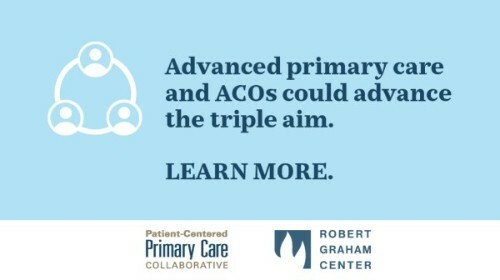 The report establishes a framework to understand the interaction between advanced primary care and the ACOs model and highlights key metrics associated with ACO success. These preliminary findings highlight the many opportunities for more research to inform policy. On the day the report was released, we hosted thought leaders in order to discuss the clinical and policy implications of the synergistic relationship between advanced primary care and ACOs. If you missed the event, you can watch the recording on the PCPCC website. In addition, the 2018 Evidence Report, Executive Summary, and White Paper outlining the key findings are available to download. PCPCC received great press coverage about the event and the report. You can view the articles below.